Curved Air Legend Sonja Kristina Releases New Anthology Featuring Newly Recorded Exclusive Tracks! Out Now! London – Legendary Curved Air lead singer and founding member Sonja Kristina has released a new 2-CD compilation called ANTHOLOGY! This is the FIRST collection of her solo works and draws on recordings from her varied solo albums, along with rare and NEWLY RECORDED EXCLUSIVE TRACKS. Released by Curved Air Records via Cherry Red, this Anthology has been personally compiled by Sonja, with custom cover art and her personal liner notes. Sonja Kristina, who topped the British Music female vocalist polls throughout the ’70s was the first UK female lead singer fronting a Rock band. She has been the constant flame leading Curved Air through the decades, and a Guiding Light in the Prog scene. Today, vibrant and edgy as ever, Sonja, the original Prog goddess gives a charismatic and highly visual performance. Looking like a glamorous gipsy queen with her flowing red hair and dressed in sparkly black, that signature voice is still as smoky and seductive as ever as she spins around the stage around the excellent musicians who are Curved Air. 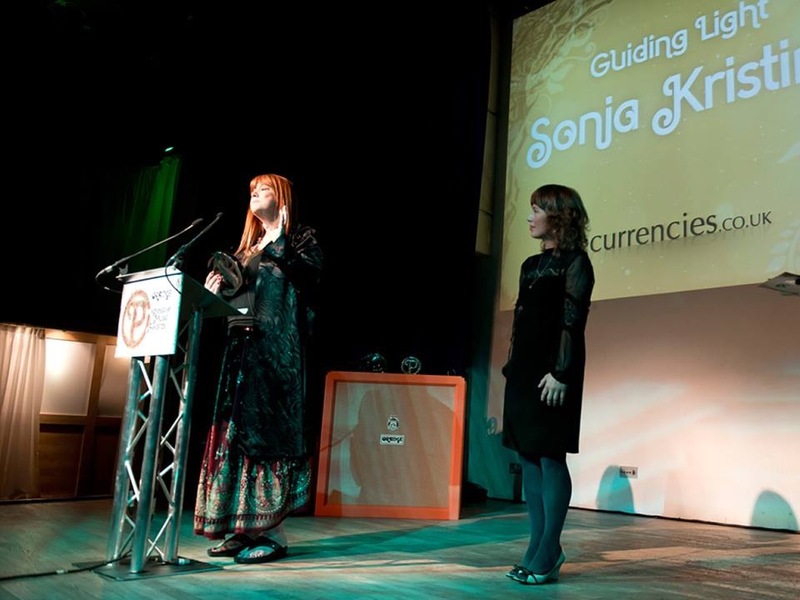 London, UK – Sonja Kristina has been honoured at the prestigious PROG Magazine Awards night held at the Globe Theatre in London. The band is best known for its hits “Back Street Luv”, “It Happened Today” and “Vivaldi”. The current line-up also features original drummer Florian Pilkington-Miksa, classic era guitarist Kirby Gregory alongside Robert Norton (keys), Chris Harris (bass) and Paul Sax (violin). Curved Air has been going from strength to strength ‎since the recent release of the band’s first studio album to feature new material in nearly 40 years, NORTH STAR.